The purpose of this CME activity is to provide a broad review of the general medical management of children. Upon completion of this course learners should be able to explain the current climate and negative effects of doping in sport. Upon completion of this course learners should be able to discuss the dangers related to water and the current recommendations for Pediatric safety. Upon completion of this course learners should be able to describe the common upper extremity injury patterns in youth athletes. Dr. Wilsey is Clinical Professor of Pediatrics and former Associate Program Director of the Pediatric Residency Training Program at the University of South Florida (USF) Morsani College of Medicine Department of Pediatrics in Tampa, Florida. He graduated from the University of Miami School of Medicine and completed residency training in Pediatrics and fellowship training in Pediatric Gastroenterology, Hepatology, and Nutrition at Texas Children's Hospital and the Baylor College of Medicine in Houston, Texas. He currently serves as the Vice Chief of the medical staff and the Vice-chairman of the Department of Pediatric Gastroenterology at Johns Hopkins All Children's Hospital (JHACH) in St. Petersburg, Florida. Dr. Wilsey is the Past-President of the Hillsborough County Pediatric Society as well as the former Florida Region V Representative of the American Academy of Pediatrics (AAP). He has served on the Endoscopy and Procedures Committee and the Clinical Practice Committee for the North American Society of Pediatric Gastroenterology, Hepatology and Nutrition (NASPGHAN), and is a member of the American Society for Gastrointestinal Endoscopy (ASGE). Dr. Wilsey has been recognized and has won teaching awards for outstanding medical education, and is the clerkship coordinator and core faculty member for pediatric residents at both USF and JHACH residency programs. His current clinical and research interests include advanced therapeutic endoscopy (including ERCP), clinical and nutritional outcomes of percutaneous endoscopic gastrostostomy (PEG) placement in children, as well as hepatobiliary and eosinophilic disorders. He has published on a wide variety of pediatric gastroenterology and endoscopy topics. Dr. Wilsey lives in Tampa, Florida with his beautiful wife and three teenage children. He enjoys reading, running, swimming, watching college and professional sports, and spending quality time with friends and family. Dr. Mularoni is a Pediatrician who splits his clinical time between Pediatric Emergency Medicine and Pediatric Sports Medicine. He is a graduate of the Lyman Briggs College at Michigan State University and the American University of the Caribbean. Dr. Mularoni completed his Pediatric Residency at St. John Hospital and Medical Center in Detroit, Michigan. His first Fellowship was in Pediatric Emergency Medicine through Emory University in Atlanta. Dr. Mularoni has been practicing Pediatric Emergency Medicine at All Childrens Hospital Johns Hopkins Medicine since 2007. He completed his second fellowship in Primary Care Sports Medicine through Bayfront Health in 2014. While at Emory University, Dr. Mularoni completed research on procedural pain reduction in the emergency setting and was awarded the American Academy of Pediatrics Willis Wingert award for best fellow research. He has continued conducting research at All Childrens looking at best practice for procedural sedation in reduction of Pediatric forearm fractures and his current research interests include concussion management, diagnosis and prognosis in patients with mild traumatic brain injuries and predictors of overuse injuries in youth athletics. He is the founder and medical director of the Primary Care Sports Medicine division at All Childrens Hospital Johns Hopkins Medicine. He also serves as the chairman of the Medical Emergency Committee at All Children's Hospital. He has worked with Sarasota, Hillsborough and Pinellas County school systems to create a uniform return to learning protocol following concussion. Dr. Mularoni authored the article on pediatric athlete concussion diagnosis and management for Family Practice Essentials. He has also written articles geared towards Physicians and the families of athletes highlighting the risks associated with early specialization and the overuse injuries this practice creates. Dr. Mularoni lectures locally and internationally on Pediatric Emergency and Sports related topics and is a regular contributor to Fox television's Good Day show. Dr. Mularoni lives in St. Petersburg, Florida with his wife Kim who is also a Pediatrician and their three young children. During free time he enjoys travel, watching Michigan State sports, skiing, and competing in triathlon, running and stand-up paddle board races. When you stay in a Celebrity Suite, you'll enjoy the luxury of European-style butler service. This includes assistance with unpacking and packing. In-suite lunch and dinner service. Afternoon tea. Evening hors d'oeuvres and complimentary in-suite espresso and cappuccino from Cafe al Bacio. 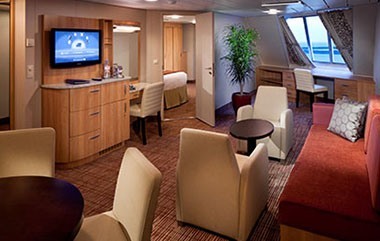 Stateroom: 394 sq. ft. Veranda: 105 sq. ft. 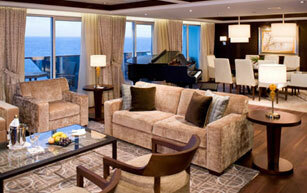 When you stay in a Sky Suite, you'll enjoy the luxury of private butler service. This includes assistance with unpacking and packing. In-suite lunch and dinner service. Afternoon tea. Evening hors d'oeuvres and complimentary in-suite espresso and cappuccino from Café al Bacio. 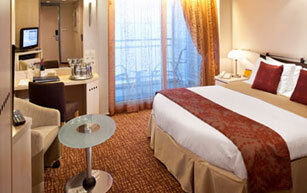 Staterooms: 300 sq. ft. and Veranda: 79 sq. 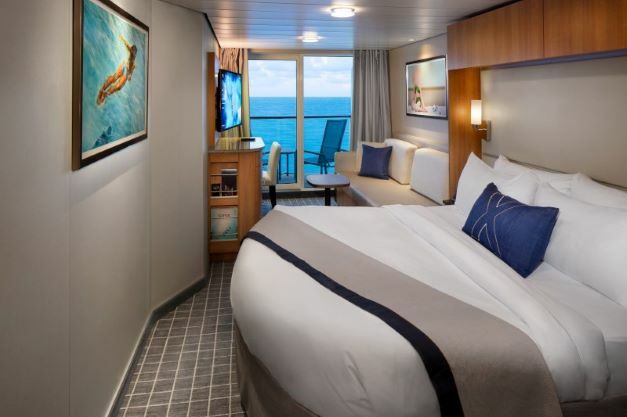 ft.
Celebrity's AquaClass veranda staterooms are perfectly suited for those with a focus on wellness and pure relaxation. 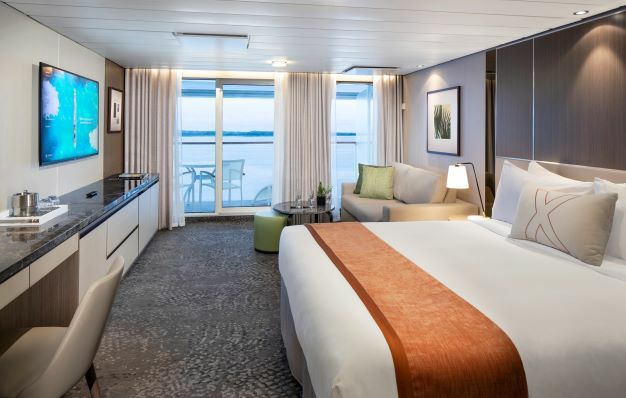 Enjoy luxurious spa elements infused into the stateroom experience, savor clean cuisine with priority seating at Blu restaurant, and escape to the Relaxation Room and Persian garden for stunning sea views. Relax with AquaSpa treatments arranged by your personal spa concierge and feel rejuvenated with wellness classes such as meditation and yoga. 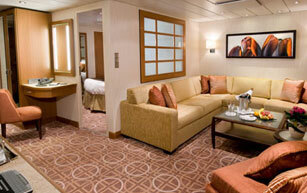 Stateroom: 191 sq. ft. Veranda: 54 sq. ft. 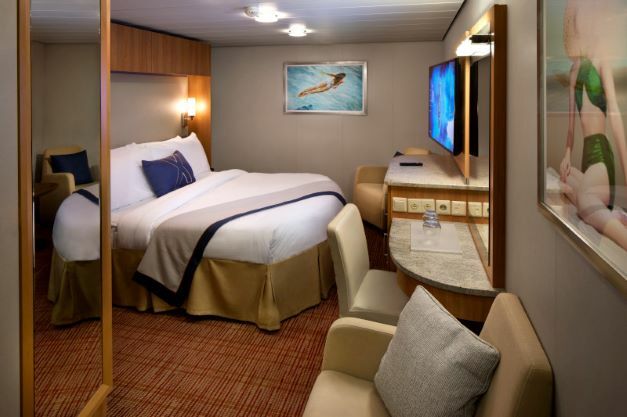 Inside Staterooms have been thoughtfully designed, with ample space to sleep, relax and enjoy your private space on board. 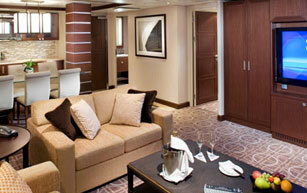 Like all Celebrity Staterooms, you will find they have done all they can to ensure ease and comfort. 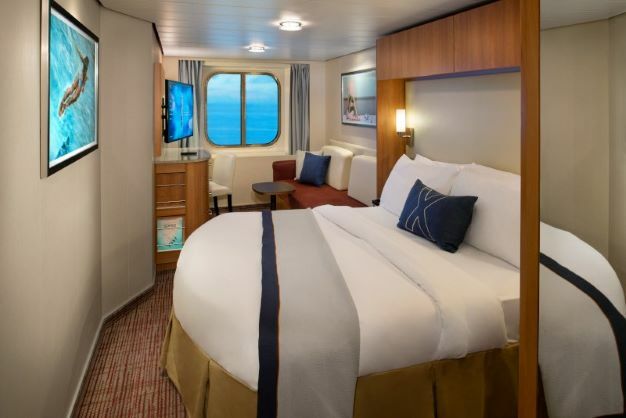 Your room includes 100% Egyptian cotton linens, plush bedding and mattresses, and lots of finishing touches that will make your stateroom feel like a real home away from home. 183-200 sq. ft. 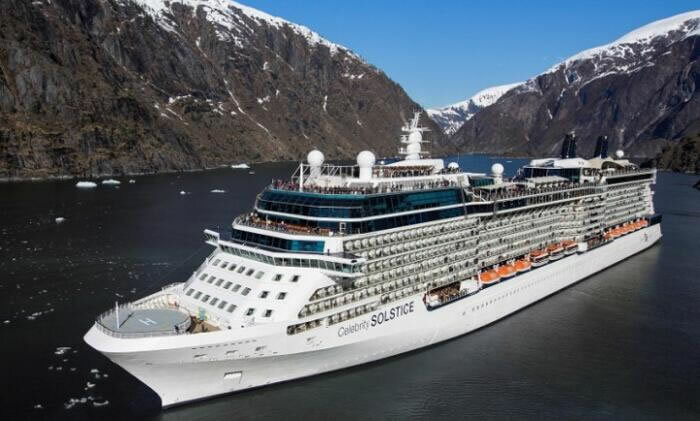 Port Charges, Taxes & Fees $461.36 per person.